At A-1 Automotive we have a Hoffman 680 Geoliner Alignment Machine. The is the latest technology to achieve a successful alignment. Our alignment machine is extra long to accommodate those very long vehicles and yet we can handle those very low sports cars. 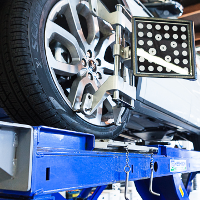 We use the tightest settings possible and come up with creative ways to align vehicles with problems out of the ordinary. We would love to keep your vehicle driving straight.